The two leading candidates for the Democratic presidential nomination traded blows Wednesday on topics ranging from climate change to national security to the very nature of "the establishment." With 12 days remaining before the Iowa caucuses, Sen. Bernie Sanders (I-Vt.) launched a new television advertisement highlighting his environmental bona fides — and an attack on former secretary of state Hillary Clinton for failing to release a comprehensive plan to address climate change. The ad, which began running in Iowa Wednesday, focuses on Sanders' opposition to the Bakken oil pipeline — a controversial proposal to transport crude oil from North Dakota to Illinois. It features two Iowa farmers speaking out against the project and praising Sanders for "say[ing] no to the big oil companies." 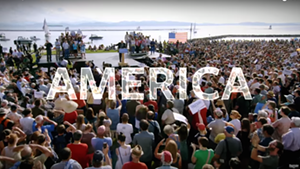 Hours after releasing the ad, Sanders' campaign issued a statement questioning Clinton's commitment to the environment, alleging that she never followed through on a July pledge to release a "comprehensive energy and climate plan." "It’s now six months later," spokesman Michael Briggs said in the statement. "What’s taking so long? Is there a pattern here? It took the former secretary of state four years to take a stand on the Keystone pipeline, which would carry some of the dirtiest oil on the planet across the United States." After posing several more pointed questions, Briggs concluded by asking, "Where is Secretary Clinton's climate plan?" Clinton campaign chairman John Podesta responded with a snarky blog post entitled, "The Sanders campaign asked where our climate plan was. I Googled it for them." The post included excerpts from speeches, press releases, news stories and tweets — all describing various aspects of Clinton's environmental platform. "While the Sanders campaign pores over those, I suggest that they explain how they plan to back out of the international climate deal that President Obama reached with the rest of the world in Paris," Podesta wrote, referring to the senator's criticism of the deal as insufficient. "After all, Sen. Sanders did come out against it." The Clinton campaign released its own TV ad Wednesday, a minute-long closing argument highlighting her experience with diplomacy and national security. Featuring footage of Clinton on September 11, 2001, in the White House Situation Room and meeting with Russian President Vladimir Putin, it makes the argument that she is "the one candidate for president who has everything it takes to do every part of the job." Says a narrator, "If you want a president who knows how to keep America safe and build a strong economy, Hillary's the choice." Later Wednesday, the Sanders campaign released an ad implicitly criticizing Clinton's foreign policy judgment — and her support for the Iraq War. “As president, I will defend this nation but I will do it responsibly,” Sanders says in the spot, looking directly at the camera. "I voted against the war in Iraq and that was the right vote. We must never forget the lessons of that experience." The tough words weren't limited to the airwaves. Clinton surrogates took to the pages of the New York Times, arguing that Sanders could drag down Democratic candidates if he topped the ticket. Clinton's highest-profile surrogate, former president Bill Clinton, took on Sanders directly during appearances Wednesday in New Hampshire, according to multiple media outlets. The candidate's husband accused Sanders of seeking to "scrap" the Affordable Care Act and criticized his plan to make public higher education free — even for the wealthy. He also piled on to growing criticism of a comment Sanders made Tuesday on MSNBC's "Rachel Maddow Show." The candidate herself said she was "somewhat confused" by Sanders' remark. “I was proud to be endorsed by the Planned Parenthood Action Fund because of the work I have done to defend women’s health, and I was proud to be supported and endorsed by the Human Rights Campaign because of the work I have done to end discrimination against the L.G.B.T. community," she said.